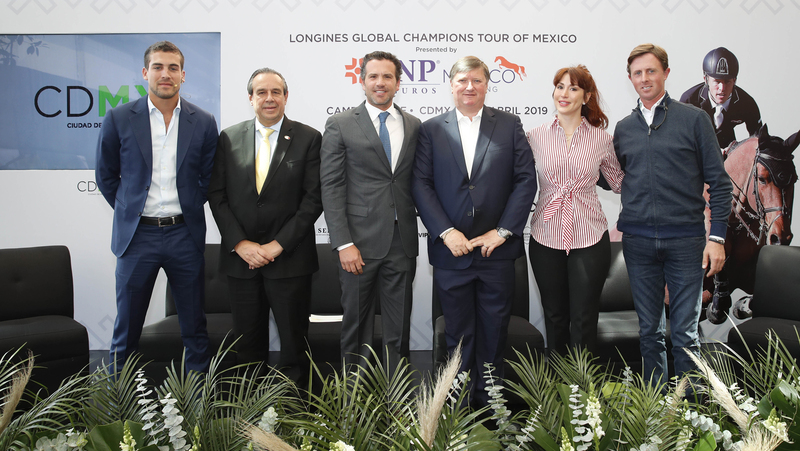 The 2019 Longines Global Champions Tour of Mexico City is officially open following a press conference today with Jan Tops (Founder and President of LGCT), Francisco Pasquel (GNP México Jumping Director), Eduardo Silva (GNP General Director), Paola Félix Diaz (Director of Tourism and Promotion Mexico City), Eugenio Garza (Mexican athlete) and LGCT 2018 Champion Ben Maher. Speaking of the strong collaboration that has formed over the years, Jan said; "We couldn’t do any of these events without our Title Partner and Official Timekeeper Longines, and presenting partner GNP Seguros, and of course our thanks to the city of Mexico - this wonderful place. This all takes a lot of work to come together and we thank everyone who puts in all the effort together with our partner Oxer Sport who have been with us since the beginning and are a great partner - we can rely on their fantastic services all the time and thank you to all the people who are involved to make this happen." Ben also spoke of the level of competition within the Championship: "At LGCT we are used to having the best horses and the best riders competing, it raises the level of the sport each week. Unlike other sports it means we have many new winners every week and this keeps the sport exciting and brings new characters and personalities forward. I have to raise my game each week to try to be better - it will be tough to win here as with every event of the Global Champions Tour it is the best riders in the world." All the action can be watched live on GC TV from Thursday 11th April onwards, click here for a full schedule.